Safer Internet Day is on February 6th! Find out more with his cool video! Tuesday 6th February 2018 is Safer Internet Day – a day all about the safe use of things like phones, computers, and the internet. Azoomee has partnered with the NSPCC to create a load of really cool videos about staying safe online! 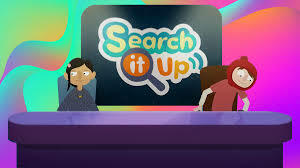 Series 1 of Search It Up! has 18 two minute episodes. There are loads on their YouTube channel and in Azoomee’s app, which is packed full of fun games and other things to watch and do. Find out more about Safer Internet Day!